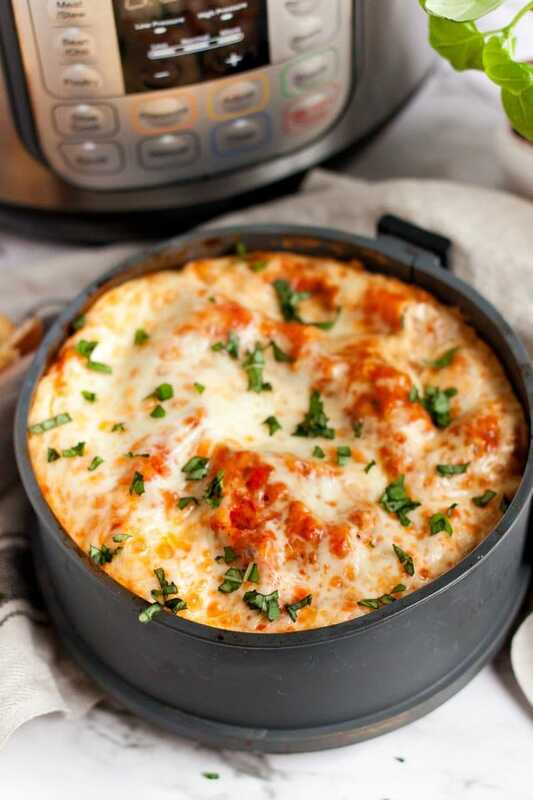 Instant Pot lasagna is something I have been wanting to try for quite awhile. I have always loved making my lasagna recipe. It’s one of my families favorite dishes. 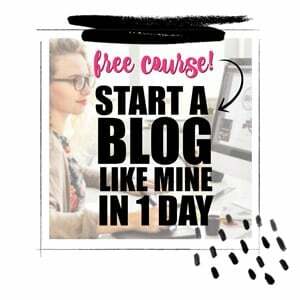 But, I initially never thought about making it by using my instant pot. The thing about making lasagna for me is that it can be very time consuming to put it all together. Using the instant pot to make it is like the lazy lasagna recipe I’ve always dreamed of. It makes it so easy, and cuts the cook time in half! If you love cooking with your instant pot as much as I do, make sure you check out my recipes for Instant Pot Wings and Instant Pot Little Smokies. 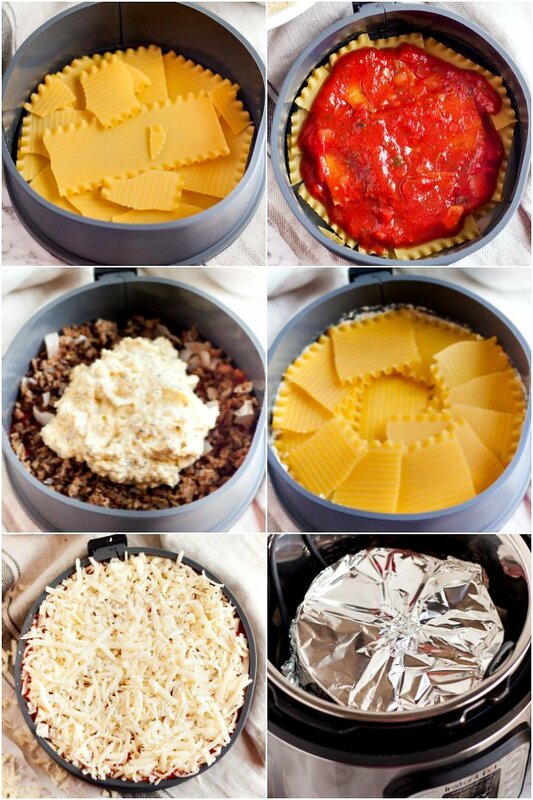 If you love lasagna, make sure you also check out our easy lasagna casserole. For those who don’t know, an instant pot is one appliance that literally does it all. It can be a pressure cooker, slow cooker, rice cooker, steamer, and more. It takes the place of so many appliances and puts them all together in one. If you’re in search of some fresh new and delicious instant pot recipes, this is a great option! This lasagna is the best. Making this in the instant pot saves tons of time! But it still takes some putting together. You can either brown the meat in the instant pot or on the stove top. I prefer to use the stove top. If you want to use the instant pot to brown your meat, just turn the pot to saute and let it heat up a bit. Then, saute the meat until it has no pink. After, you can add in the garlic and onions. Saute it a bit more, until the onions are clear. Next, mix all of the cheese layer ingredients together, put them together in a big bowl, and set this aside for later. Then comes the layering! You will want to layer the ingredients in the following order into a 7-inch springform cake pan. Layer One: Cover the bottom of the assembled pan with about 3-4 broken no-boil noodles. Layer Two: Thoroughly cover the noodles with 1 cup of the pasta sauce. Layer Three: Spread 1/2 of the meat mixture evenly on top of the sauce layer and press it down slightly. Layer Four: Spread 1/2 of the cheese mixture evenly on top of the meat layer, again press it down slightly. Repeat all four steps another time. Add the final layer of no-boil lasagna noodles and press them down slightly. Cover the top with sauce and sprinkle 1/2 a cup of mozzarella cheese on the top. Then, spray a sheet of aluminum foil with non-stick spray and cover the pan. Add 1 1/2 cups of water to the instant pot. Place the covered lasagna pan on a trivet with handles, then place it in the pot. Lock the lid and seal the valve. Press the manual button twice and set the time to 25 minutes. All for a natural release for 10 minutes. Then, perform a quick release. Open the instant pot and transfer the lasagna out. Then, remove the foil. Place the lasagna pan on a baking sheet and put it in the oven on broil until the cheese begins to brown. Make sure to keep a close eye on it so that it doesn’t burn. When you take the lasagna out of the oven, rest it on a cooling rack for about 15 minutes. Next, release the lasagna from the sides of the springform pan and garnish it with fresh parsley and you are ready to slice and serve it. I love to serving caesar salad on the side. It’s the perfect Italian combo. I also like to serve my lasagna with cheesy garlic bread, or any kind of bread for that matter. I love using the bread to dip in the sauce. Plus, I always love an excuse to eat garlic bread. For dessert, we love this delicious blueberry cobbler. Reheating pasta can be tricky. I find that often, the noodles can get a bit soggy. To prevent this, I usually cover the lasagna with aluminum foil and bake it in the oven until the inside is completely heated all the way through. Sometimes it can take around half an hour, but it’s totally worth the wait to reheat using this technique. You really can’t beat a good lasagna. It’s always been one of my favorite go-to recipes for a delicious family dinner. But, the fact that I now have an amazing lasagna recipe that can easily be made in my instant pot is a time saver. Get out your instant pot and give this one a try. It will be something your whole family will enjoy eating and you’ll actually enjoy making. The thing about making lasagna for me, is that it can be very time consuming to put it all together. 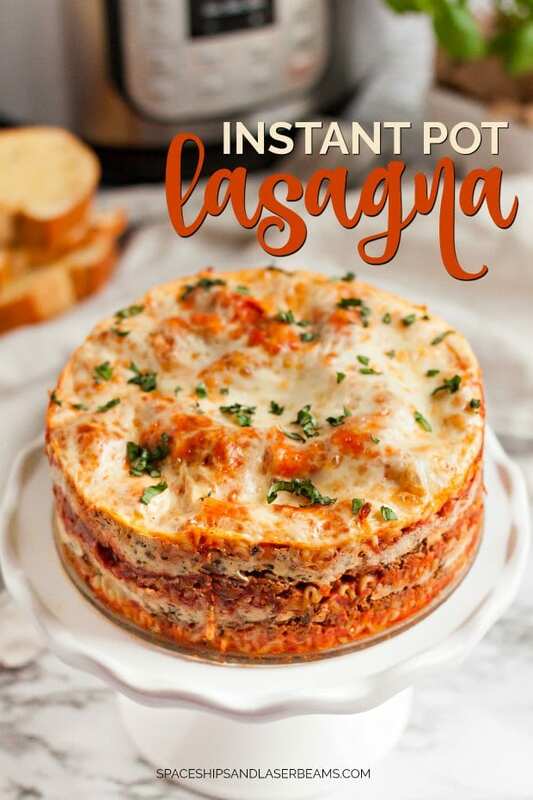 Using the instant pot to make is is like the lazy lasagna recipe I’ve always dreamed of. It makes it so easy, and cuts the cook time in half! Mix all ingredients listed in the "Cheese Layer" section of the ingredients list. Stir to combine and set aside. Brown beef until no longer pink in a pan on the stove. Add onion and minced garlic. Layer One: Cover the bottom of the assembled springform pan with about 3-4 broken no-boil noodles. Layer Three: Spread 1/2 of the meat mixture evenly on top of the sauce layer. Press slightly. Layer Four: Spread 1/2 of the cheese mixture evenly on top of the meat layer. Press slightly. Add a final layer of no-boil lasagna noodles. Press slightly. Cover with sauce and sprinkle 1/2 cup of mozzarella cheese on top. Spray a sheet of foil with nonstick spray and cover the pan. Add 1 1/2 cup of water to the pot. Place the covered lasagna pan on a trivet with handles then place it in the pot. Lock the lid and seal valve. Press the Manual button twice and set time to 25 minutes. Allow natural release for 10 minutes. Then, perform a quick release. Open the Instant Pot and transfer the lasagna out. Place on baking sheet in oven on broil until cheese begins to brown. Watch it closely so it doesn't burn. Remove the lasagna from the oven, and let it rest on a cooling rack for 15 minutes. This will help maintain its shape when you try to remove it from the pan. Release the lasagna from the sides of the springform pan. Garnish with fresh parsley if desired. Slice and serve. 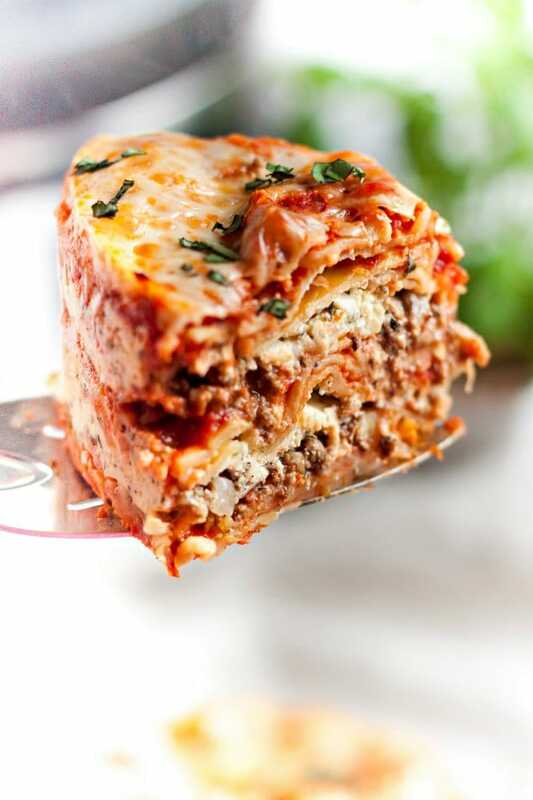 We love lasagna – all Italian really! 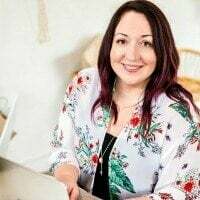 – and I’m excited to try this in the Instant Pot! 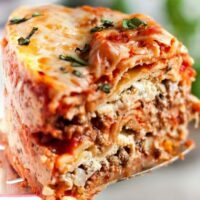 Where did you find the Lasagna Noodles like shown in your recipe? I hate the Flat No Boil Lasagna Noodles. I’ve even thought of soaking Regular Lasagna Noodles in boiling water to soften and then layer with ingredients before adding to my IP. I’ve done 1 in my IP, but want to change it up with different noodles. Did save your recipe. This is in my insta pot right now! I’m so excited to try it! I added some fresh mozzarella on the top. It was a little time consuming to make but I’m sure it’ll be worth it. Thanks for the recipe! Can you tell me the springform pan you used? I have a 7”x2.25” & the recipe was too much. We really enjoyed it but want to find a pan to fit all of it in! This is the pan we used > https://amzn.to/2IqTJfC When I made the recipe myself, I had a few noodles from the box leftover but no meat or filling. The pan dimensions are 6.9 x 6.9 x 2.6 inches – hope that helps!